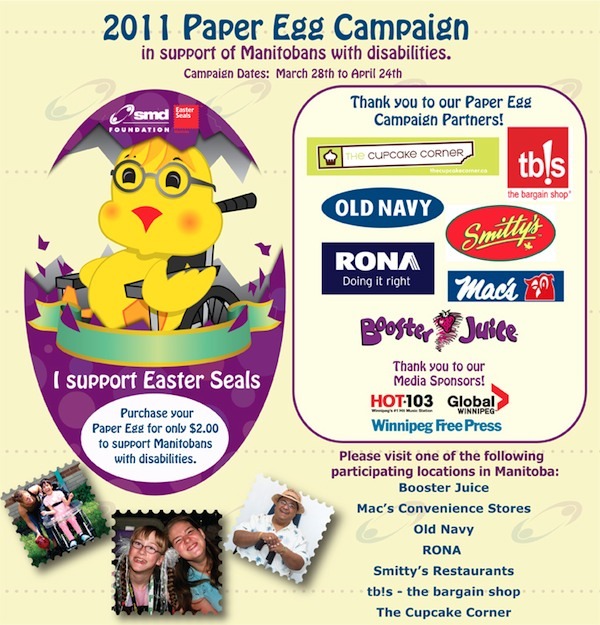 The SMD Foundation and Easter Seals Manitoba are hatching the 2011 Paper Egg Campaign today to raise money for programs and services benefiting children, youth and adults with disabilities. From now until April 24, a number of participating retailers will be selling a Paper Egg for $2.00. Customers can write their name on the egg, which will then be displayed in the stores. Proceeds from the sales will help more than 40,000 Manitobans living with a disability. The campaign is expected to raise in excess of $50,000 in the province. Paper Eggs can be purchased at the Bargain Shop, RONA, Smitty’s Restaurants, Old Navy, the Cupcake Corner, Booster Juice and Mac’s Convenience locations province-wide.